There are two groups of painters that to my mind seem awfully old-fashioned and chocolate box, and having seen their work I feel the need for a blast of Howard Hodgkin or Leonora Carrington. And yet, despite being immensely popular crowd pleasers now, in their time they were as revolutionary as YBAs. I mean the Preraphaelites and the Impressionists. This seems an innocent enough landscape, a suburban church on a spring day. It’s Sydenham, in 1871. The church is still there, although Camille Pissarro makes the tower taller. 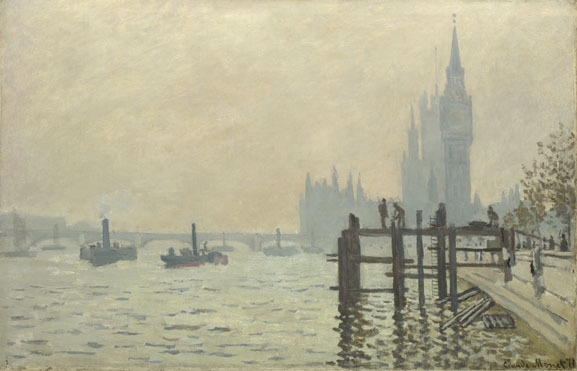 And here’s Monet’s Westminster in 1871. That tower looks wrong. These and about eighty other paintings were brought together in an exhibition at the National Gallery, based around the dealer, Paul Durand-Ruel, who was a champion of the Impressionists. He had inherited the painting business from his father, and saw potential for an emerging group of artists in Paris in the 1860s. He bought cheap when the market was low, then sold at a huge profit. He seems also to have manipulated the market at times to bid up prices. In 1870 he left Paris, to get away from the Franco-Prussian War, and in a London gallery began a series of shows of French artists. 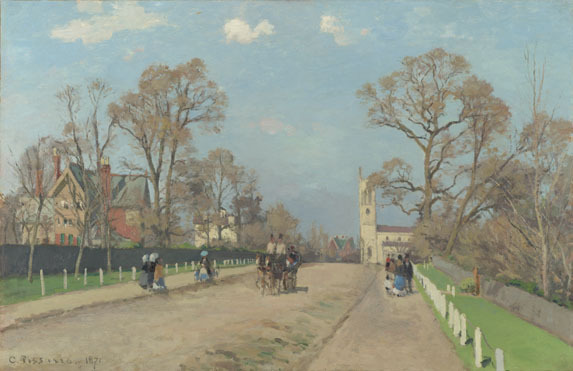 He also met artists such as Claude Monet and Camille Pissarro, who were also living in London. If the French weren’t interested, maybe the British would be. He paid artists a monthly wage and focused on individual artists for catalogues and exhibitions. Whilst his business was subject to the rises and falls of the French economy, he clearly was a hugely successful dealer. And he looked from Europe to America, where a new market awaited, sending one of his sons out there to manage affairs. 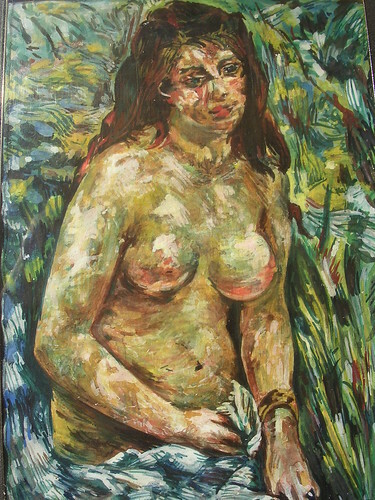 Albert Wolff in Le Figaro wrote “Try to explain to Monsieur Renoir that a woman’s torso is not a mass of decomposing flesh with those purplish green stains that denote a state of complete putrefaction in a corpse.” Imagine if they saw a Paula Rego or a Lucian Freud. They’d have heart attacks. I guess it’s a failure on my part to think myself back into the 1870 mindset — it doesn’t feel revolutionary. It feels nice. ← Previous Post Murder Your Darlings?